Join us for the first WATERtalk of the 2017-2018 season with Rev. 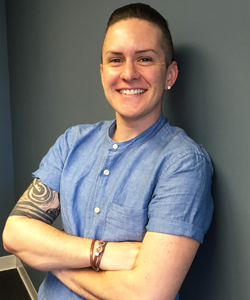 M Barclay, the first non-binary trans person to be commissioned as deacon in the United Methodist Church, who will discuss their ministry. Rev. M Barclay is the Director of Communications for Reconciling Ministries Network, an organization working for LGBTQ inclusion in the United Methodist Church. M served for two years as staff liaison to United Methodist Alliance for Transgender Inclusion (UMATI). M received a Master of Divinity at Austin Presbyterian Theological Seminary. They have worked as a hospital chaplain, youth director and justice associate, and faith-based organizer for reproductive justice. M also does extensive speaking, writing, preaching, and teaching on the intersections of faith and social justice. A self-identified theology nerd, M is convinced that in every conversation about social justice and being human, there is an opportunity to engage the Divine, Mystery, Love, and the interconnectedness of all of creation. M is pansexual and a non-binary trans person who uses singular they/them pronouns. September 21 WATERritual: Lifting Up Women Peacemakers WATER Welcomes New Staff Associates!